Pokemon Shuffle usually has a couple Special Stages going on at any point in time such as the Groudon stage that recently went live. Well, Pokemon Safari just launched and will run for 12 days. It ends on 5/2/2015. 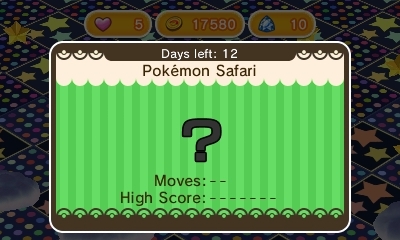 Pokemon Safari features no "Optimize" button and the Pokemon changes every time you play the stage. There are likely only 5~ different Pokemon that will appear giving the history from the Daily Pokemon events. Anyway - be sure to Check-in to get it and give it a shot!